BVI Constable Teddy Creque is called on to capture a shark that has attacked and killed a woman off Virgin Gorda. But sharks don’t usually attack humans unless they are dead or wounded, and Teddy sees a cut on the woman’s neck that doesn’t appear to be caused by shark’s teeth. The story unfolds around unique characters, including a brilliant boy who almost never speaks, a parrot who repeats everything he hears, a Russian ex-spy, “De White Rasta” Teddy’s cohort from the previous story, and various other fascinating participants. For me, the setting draws me back to the islands. I can picture the people, the shops and houses, the tropical flowers, the warm humid air, the beautiful clear water—even the birds are familiar. 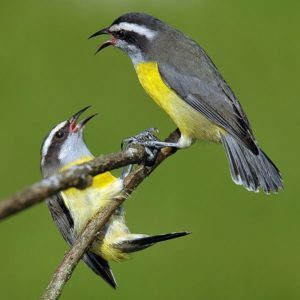 I haven’t seen or heard of a bananaquit since I lived in the Bahamas where they would join me for breakfast on the veranda, stealing my food. I also appreciate that the author didn’t drag us through the protagonist’s depression as many crime novels do. Teddy apparently went through a period of moping over his mistakes and his affair with a not-so-nice woman between novels. But he mostly has his act together by the time this story happens, although he doubts his policing skills from time to time. Keyse-Walker’s second novel is as engaging as his first. He again captures the spirit of Caribbean island life. This time on Virgin Gorda, a tiny bit faster-paced than Anegada where his first book took place, due to more people, more tourists, etc. I’m delighted that I went back for seconds.